This situation has continued absolutely uninterrupted since March 9, 1933. We have been in a state of declared national emergency for nearly 63 85 years without knowing it. “The actions, regulations, rules, licenses, orders and proclamations heretofore or hereafter taken, promulgated, made, or issued by the President of the United States or the Secretary of the Treasury since March the 4th, 1933, pursuant to the authority conferred by Subsection (b) of Section 5 of the Act of October 6th, 1917, as amended [12 USCS Sec. 95(a)], are hereby approved and confirmed. (Mar. 9, 1933, c. 1,Title 1, Sec. 1, 48 Stat. 1]”. Chapter 1, Title 1, Section 48, Statute 1 of this Act of March 9, 1933 is the exact same wording as Title 12, USC 95(b) quoted earlier, proving that we are still under the Rule of Necessity in a declared state of national emergency. For over 60 80 years, no President has been willing to give up this extraordinary power and terminate the original proclamation. United States [citizens] are all enemies subject to tribunal district courts under Martial Law wartime jurisdiction; a Constitutional Dictatorship. Twenty years after the state of emergency was put in place, BAR attorneys managed to get state legislatures across the country to insert the Uniform Commercial Code into their statutes. “All this was accomplished by the mid-1960s.” ** Today the UCC is the law of the land – not the U.S. Constitution. ** From attorney Melvin Stamper’s book Fruit from a Poisonous Tree, page 62. This entry was posted in Government, Legal System and tagged 14th Amendment, 1933, enemies of the state, federal reserve, national emergency, war powers. Bookmark the permalink. Wow, I knew was bad….. This notion of citizenship is a hard nut to crack with Americans. We just can’t rid ourselves of this idea. It’s easy: A citizen is a “person” who is subject to statutory/Admiralty law. Put more simply, a citizen=slave. What is amazing is that Senate report from the Church Committee (Sen. Frank Church headed it) was available as recently as the late 1990s to my knowledge through the government printing office. In other words, the government still was distributing the proof offered by the Church committee report that we were living as enemies of the state; not that WE declared to be enemies but the the corporate United States government declared us as enemies. 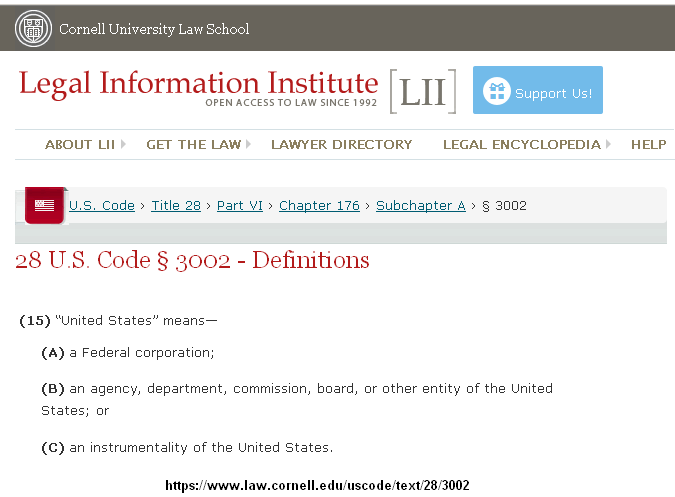 Please correct me if I am wrong as you are much more knowledgeable about this but I do not believe there is any mention made whatsoever in the constitution for the united States of America regarding an emergency overriding constitutional protections. In other words, our founding document did not recognize anything that trumped the fundamental rights recognized and guaranteed by our charter. Someone afterwards came up with the idea that, if an emergency is declared, it is “necessary” to suspend ALL the protections that were EXPLICITLY guaranteed in our founding documents. And even more egregiously, there was no mechanism to force the return to full constitutional protections when the declared emergency passed. A president who wished to return us to the status quo ante would likely have to keep the thought to himself and declare it as a surprise on national television; otherwise it is a near certainty he would not live long enough to sign such an order. The good news is, there is NO moral or legal objection that can be raised to any armed resistance should it come to that. They have declared themselves our enemy since 1933 and each officer of that government is, by definition, an enemy combatant. One could judge any action taken by a state citizen in self defense as moral and legally unassailable. There are those that maintain the position that the Constitution did not allow for its suspension during a state of emergency. However, it is in place never-the-less. So, the only Americans who are NOT enemies are non-citizens. You didn’t read it. The article states that according to Congressional Record in 1967, the 14th Amendment was not ratified. Be that as it may, in 1933 United States citizens were classified as enemies of the state during a national emergency, which has been ongoing ever since. That FACT was well established in the body of the article.